On the whole, the government’s modernization effort, despite its Russian peculiarities, reflected some of the more general global trends of the twentieth century and evoked cooperation of different sectors of the population. Thousands participated in the “great construction project of socialism” with a will to self-sacrifice, accepting hardship with a real sense of comradeship. Many were inspired by the Bolshevik vision of socialism and gave it their full support. The wave of labor enthusiasm was reinforced by carefully stage-managed propaganda campaigns leading to the appearance of “socialist emulation” as a form of competition for greater labor productivity among workers. The Stakhanovite movement, named for the record-breaking coal miner Aleksei Stakhanov, is perhaps the best-known example of the shock-worker competition of that period. Such an unprecedented growth of production cannot be regarded as a simple and ordinary development of a country from backwardness to progress. It was a leap, with the help of which our Motherland had been transformed from a backward country into an advanced one, from an agrarian country into an industrial one. This historical transformation had been accomplished in an incredibly short period of time. It had required about 13 years starting from 1928. Stalin claimed that industrialization and collectivization were the twin cardinal policies of the Communist Party that made this feat possible. The scale of achievement in the heavy industrial sector was particularly staggering. From 1928 to 1941, 9,000 large-scale industrial plants were built, or 600 to 700 each year. In a short period of time an industrial capacity was built characteristic of the more economically advanced countries. 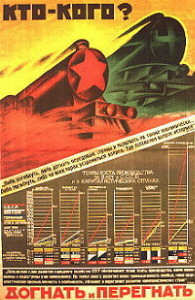 In terms of its branch structure and technological sophistication the Soviet economy now stood at a level comparable the industrialized countries of the capitalist West. The industrialization enabled the Soviet Union to mass-produce aircraft, trucks, cars, tractors, combine harvesters, synthetic rubber, and different types of equipment designed primarily for the expansion of heavy industry and military might. In the years of the “great leap” industrial production grew at an average annual rate of 10 to 16 percent, displaying the remarkable dynamism and seemingly boundless potential of the new economic system. By 1937 the USSR was second only to the United States in its gross industrial output (in 1913, fifth place).